Moms! 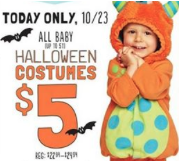 Today only (10/23), stop by Old Navy today to grab ALL Baby or Toddler Halloween Costumes for just $5 (Reg. $24.94 Value! ), in-store only. Plus 50% off ALL Halloween items through 10/27. No coupons needed but you should be able to use any additional coupons to get an even bigger discount. For more details, go here! Thanks Lynn, Maranda and Christina!